Premature Nostalgia: This post is boring, but you like it. Most people describe their first time as being nerve-wracking and full of uncertainty. But I'd been thinking about it about too long. I wanted it too much. There was no need to be embarrassed. So when the moment finally came and it was clear we were both ready, I was prepared. I confidently pulled out my coupons and handed them over to the cashier. And then I laughed all the way to the bank. 1) Although I've always had a solid understanding of value, I'm realizing that I have very little understanding of price. I'm good at weighing a purchase and determining its worth. But I have no idea the typical regular price of items that I frequently buy. Is toothpaste usually $10 or $5? I have no idea. 2) Nothing should ever purchased at full price. Year of the Deal is changing the way I shop. Rather than simply purchasing the "necessities" on my list, regardless of price, I now walk up and down the aisles looking for sale stickers. I'm starting to buy things that I don't need in the immediate future because they're on sale now. 3) Unfortunately, having room to build an inventory really is key. Since everything eventually goes on sale, you need to stock up when it does--otherwise you end of buying things at full price. 4) Different locations of the same chain may have different prices. (For instance, Dove body wash at the Shoppers on King & Peter was on sale for $5.99 on Thursday night. On Friday, I went to the Parkdale Shoppers only to discover it was on sale for $4.99. I was so upset about the loss of a $1.00 that I dropped a f-bomb right there in the store.) I always just assumed that all the chains in the same city would have the same prices. -For purchasing over $50, I got a $10 gift certificate to Shoppers. 1. To determine how much I'm actually spending in a month on groceries and pharmacy items. 2. To gain a better understanding of value vs. price. 3. To determine the best possible price that I can purchase items for. 4. To track my overall savings for the year. 5. To justify my new obsession to people. The first tab of the spreadsheet I created tracks purchases made at the drugstore. 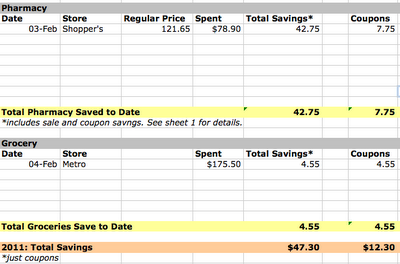 I typically buy products at Shoppers and will likely continue to do so, but if I pick up laundry detergent or toilet paper at Price Chopper or Metro, I will put it into this spreadsheet for price comparison. My hope is that with this spreadsheet, I'll not only develop a better idea of the value of products, but also of the price. On the second tab, I'll transfer all the information from the first tab into the pharmacy section. In the grocery section, I'll track information on my food purchases. The key difference between the two categories is that the pharmacy "savings" will include savings by purchasing something on sale (because it's easier to track--I'll be sure to right down the regular price while I'm in the store) while the grocery savings will only track savings from coupons. 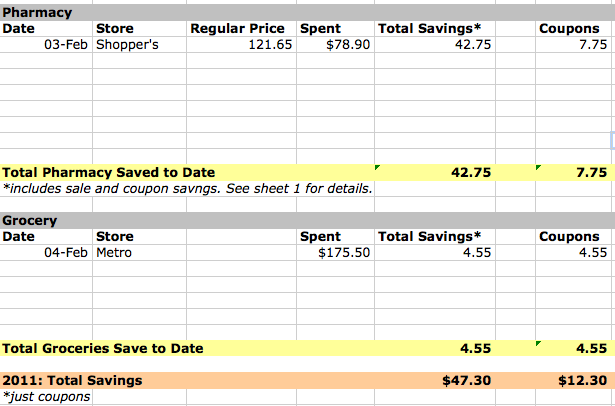 This spreadsheet will help me track my total savings for the year, as well as how much I've saved from clipping coupons. It's also meant to give me a better idea of what I typically spend so that I can identify where I can cut back. You notice those people who walk around with a calculator? Does your phone have a calculator function? It sure does. That's why it was extra stupid that I thought I was buying $50 worth of stuff and it was actually $80. I actually think this is a great idea. I track my spending monthly too to see where I can cut it back (and I definitely need to)! I have been using coupons for the last year or so and now think anyone who pays full price for anything is nuts! I also wander down aisles and look for the sale stickers. It really does make a big difference in the long run and especially on products that you buy anyway! I'm intrigued at the thought of this 'saving money' you talk about, but I'm glad it's you doing this penny pinching and not me! I have a couple expensive toiletry habbits that I cannot give up (LUSH).